Do you have a ‘smartphone?’ Odds are, you happen to be one of the estimated 37.9 million Apple users or 23.8 million Android users, not including Windows and Blackberry mobiles, who jump on that mobile device every single day. According to the “State of the Media 2001,” 84% of US adults own a smartphone or tablet computer. Mobile marketing is becoming a wonderful opportunity for business looking to increase brand awareness through mobile sites, mobile apps, mobile ads, and location-based services. But how do you adhere to your brand message across this mobile medium? Well, follow these easy tips. As with any other form of marketing, understanding your audience through segmentation and deep demographics is key. Is your target audience engaged on mobile social networks? Are they actively ‘checking in’ to local hot spots? What kind of operating systems and mobile devices do they use? Does their mobile support flash? How often do they share video and pictures? How often do they check local news and weather from their mobile devices? All of these questions must be taken into account when considering mobile marketing plans. According to ComScore, there is a wide gap in demographics when it comes to those who share and engage in mobile social networks and those who simply spend time checking news, using Google searches, checking email, and looking at the weather. These statistics show that an amazing 70% of mobile users age 18 to 29 consume local news and weather through the mobile devices. Remarkably, 87% of those who own a mobile device frequently use it for email and internet access. If mobile marketing is for you, and your advertising and marketing team has found that your audience would respond well to mobile apps and mobile ads, it’s time to consider QR Codes. As we’ve mentioned before a few months back, QR Codes are wonderful little resources for providing your audience with instant access to anything on the mobile web. This might include instant access to your mobile website, a banner advertisement, a targeted online coupon, perhaps a Groupon special, Google Maps, and much, much more. As with anything else, the QR Code is a resource that must be implemented according to your brand message. Utilize your creative team when determine how you’d like to incorporate the QR Code into your marketing. Don’t be afraid to be unique and take risks with the appearance of the code appearance. QR Codes can be as creative and unique as your imagination. For example, take a look at the Coca Cola advertisement below. 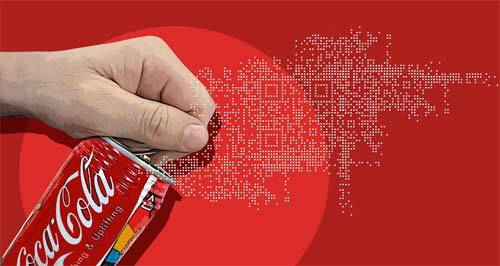 Do you notice the QR Code subliminally hidden within the Coke bubbles? When considering the use of these codes, keep in mind your audience and market segment. Does your audience show interest in using barcode readers on their mobile devices? QR Codes are still a fairly new idea here in the States, so be sure to discuss with your marketing and advertising team whether this is the right route for you.